I have had a few requests lately for my chicken soup recipe, so thought I would share here. I found this recipe a couple of years ago on Tonia’s blog, but just got around to making it this year. I must say it is the BEST CHICKEN SOUP I have ever made or tasted. Thank you Tonia! I LOVE the flavor that the ginger and cayenne give this soup. I am throwing out all my other chicken soup recipes and keeping only this one. I honestly believe it does have medicinal qualities! For building immunity the garlic, ginger and cayenne are very beneficial. Put all in a large pot. Bring to a boil and let simmer for an hour (or 3 or 4 or whatever). Remove chicken, set aside to cool. Bring to a boil and let simmer for about an hour. Meanwhile, pull meat off bones. Leave lid on and let simmer for another hour. notes: this recipe is VERY flexible. You may use canned broth and precooked chicken. You can add any ingredients you want to the stock. Once the chicken is cooked, you can cook the soup for a shorter or longer amount of time. I’ve found the soup has a richer taste the longer you let it simmer, but it is good either way. And while I am at it I might as well share with you another soup recipe, since we are having a little cold snap here in Florida. This TUSCAN BEAN SOUP I made tonight was better than expected. I altered this one a bit so decided to just scan the recipe and share my scribbly notes with you. If I was a “real” blogger, I would have nice photos to show you of these soups, but you will just have to use your imagination. Trust me. They are yummy! Yum! They both sound really delicious. (I love Tonia, and I love Saveur magazine, so how could I go wrong with either one?!) I just ate a delicious bowl of bean soup that my niece brought me (she lives in the apartment above me, made it for her dinner tonight, and decided to share it with me. Soup is so good on cold days like today. Hi Susan! So nice to have you stop by! I just went to your blog to find the post where you talked about have lentils and rice with carmelized onions, and was sad to see that your blog is no more 😦 But I truly do understand. Just wanted to tell you that I had scribbled out your description of the lentil dish and made it not too long ago. We LOVED it! So thank YOU! All the best to you in your journey ahead. I will truly miss you and your writing. Thankfully I printed out your last post, which I found so encouraging and full of wisdom. Thank you for sharing these recipes, Ruthi! They look so yummy and just what we would eat. I especially love the idea of the chicken soup with ginger and mushrooms. YUM! i think it would truly be medicinal if you made it all from scratch. There is nothing quite as good as homemade chicken broth. It makes all the difference. 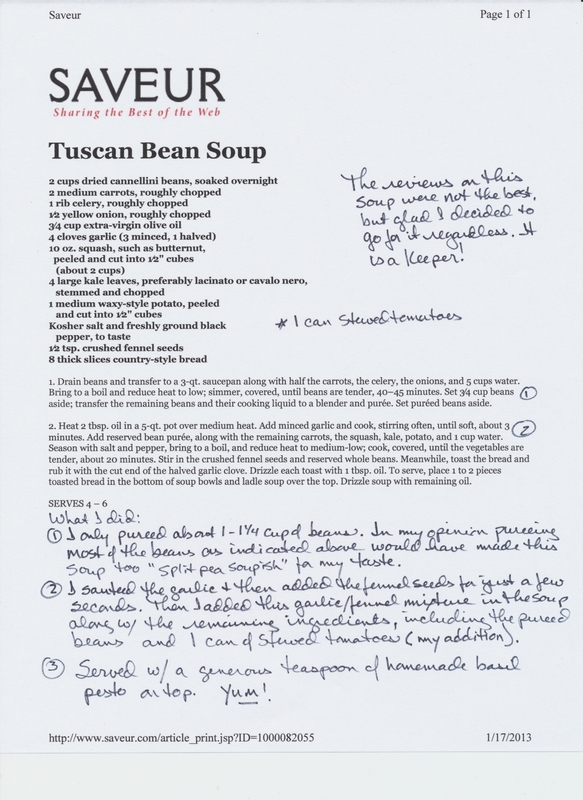 And I love all your notes on the bean soup recipe! I do the same thing. Thanks again for posting them. Hi Trish! I attempt to make things from scratch most of the time. I just think things taste better that way. 🙂 Let me know if you try the recipes and what you think of them. enjoy your snow!